As an organization of women committed to promoting voluntarism, developing the potential of women, and improving the community through the effective action and leadership of trained volunteers, the Junior League of Washington (JLW) recognizes the outstanding efforts and contributions of its members each year through the Sally Carruthers Spirit of Voluntarism Award and the President’s Award for Excellence in Voluntarism. First awarded in May 1985, the Sally Carruthers Spirit of Voluntarism Award is JLW’s highest award and recognizes members who have made exceptional contributions of time and voluntary efforts to the League and the greater Washington, DC, community throughout their life. Recipients of the Sally Carruthers Spirit of Voluntarism Award have consistently demonstrated leadership and dedication to voluntarism over the years; through both League involvement and personal community activism, they have strengthened and improved our communities and encouraged others to volunteer. In 1988, JLW expanded its awards program with the President’s Award for Excellence in Voluntarism, awards honoring members who have contributed outstanding volunteer service during the most recent JLW fiscal year. Each year, three awards are given, one in each of the following areas of voluntarism: Community Placement, for direct service to the community through JLW placements; Community Support, for service to the community through support activities such as training, fundraising, collaborative efforts, outreach, and public awareness; and In-League, for service to the community through JLW and its members, such as membership services, programs, placement, and finance. 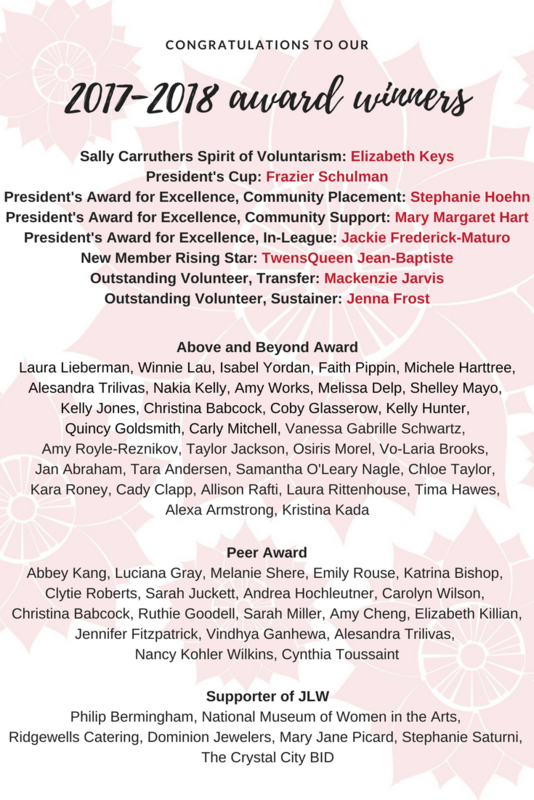 JLW also recognizes the runners-up to the annual President’s Award for Excellence with an Above and Beyond Award Certificate.